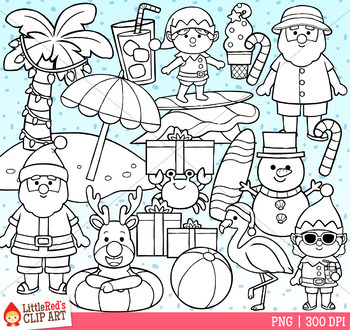 A cute collection of tropical Christmas clip art! Includes Santa in vacation wear, swimming reindeer, snowman made of sand, flamingo, wave, beach, decorated palm tree, elves, candy canes, ice cream, gifts, etc.! This set is also available in our Crazy for Christmas II Clip Art Bundle!